I did an Easter Craft round-up hub recently and I was surprised at how many Easter wreath and topiary tutorials I saw. 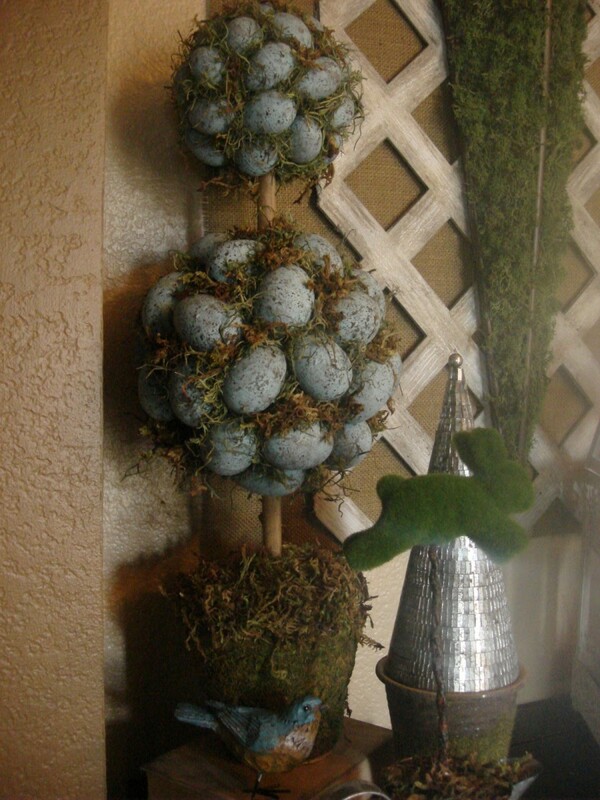 I decided I needed to do one more hub just on tutorials for Easter wreaths and topiaries. These are all adorable, easy and fairly inexpensive to make and each one has a tutorial link with it. Lots of them use plastic eggs, some have embellishments made from paper and some are even decorated with Easter candies like Peeps and jelly beans. ALL of them are beautiful, bright and absolutely perfect for Easter time. 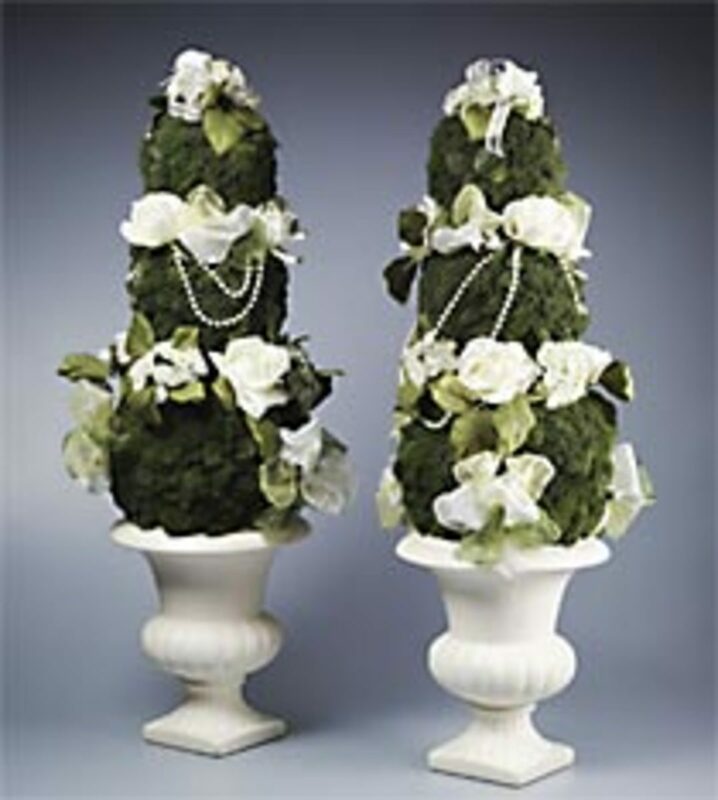 The topiaries can be used inside and outside for décor. I think they would look especially cute sitting on the patio-maybe a matching set on each side of the door and any of the wreaths below would look gorgeous hanging on a front door. 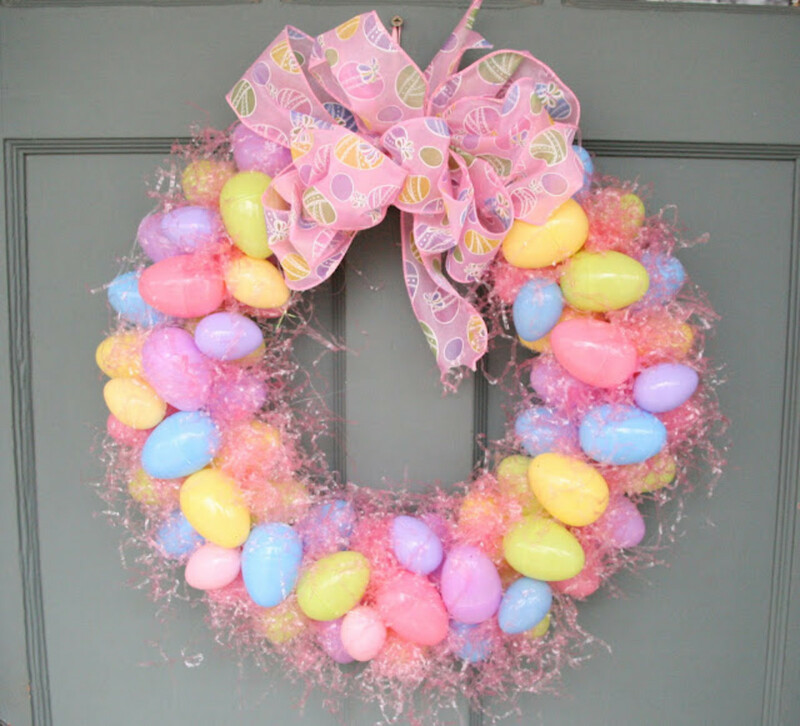 Kennedy Klan News shares the tutorial for this cute, plastic egg wreath. 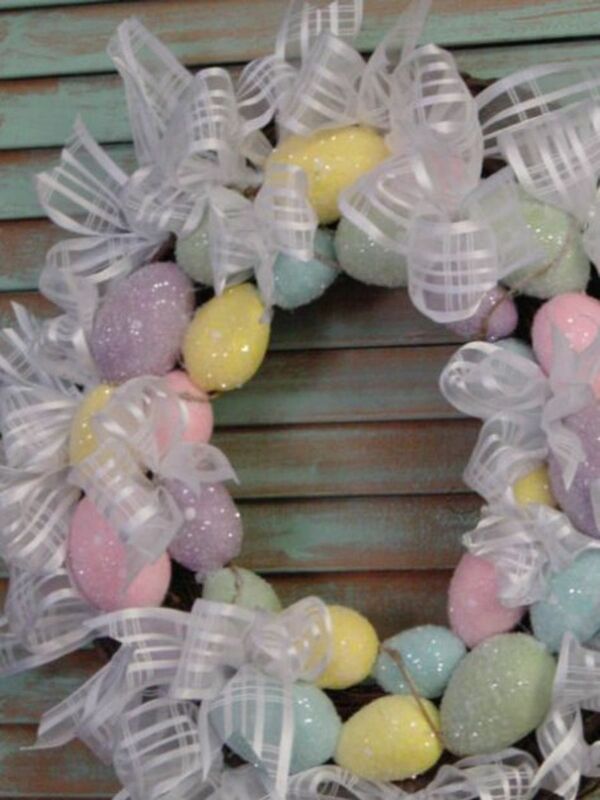 I think this is the perfect wreath for Easter. I love how the eggs sit in the pink Easter grass. The colors are perfect and I LOVE the huge pink bow. 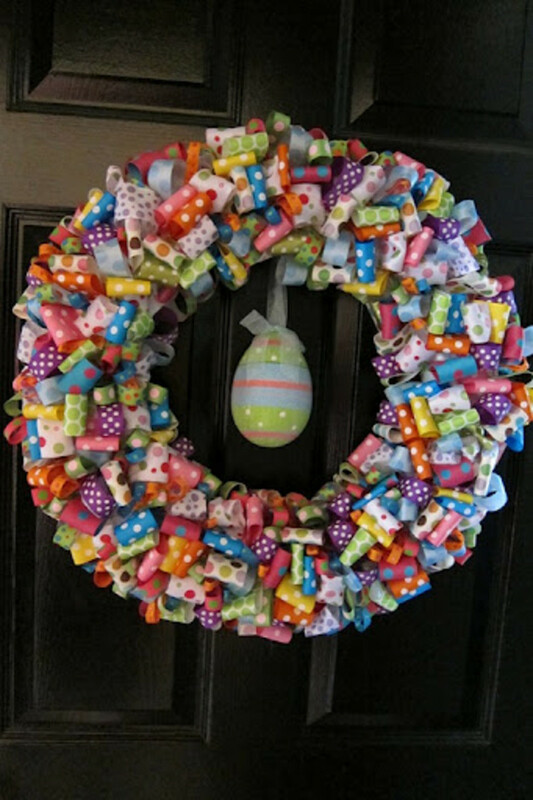 The Dollar Diva shares how she made this pretty wreath with a Easter wreath that was in a "dollar" bin. 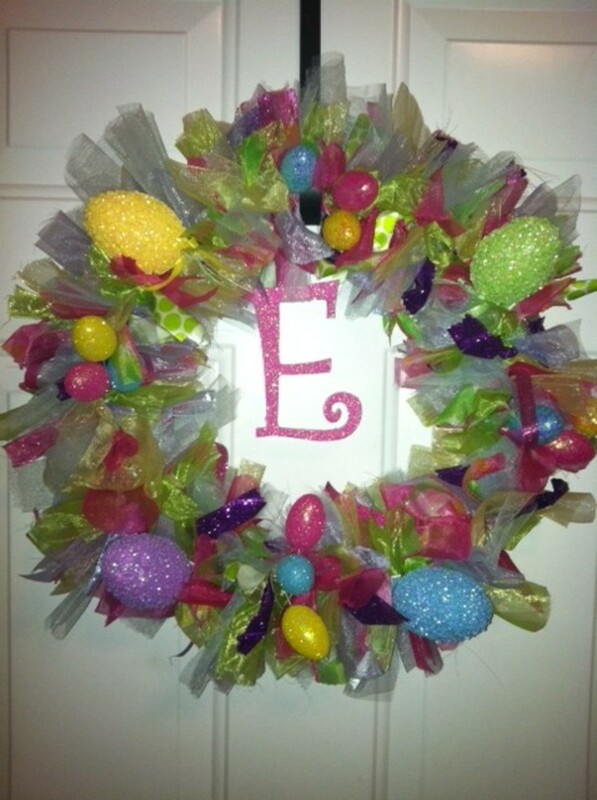 She just added a few things and then ended up with this beautiful sheer ribbon and sparkly egg wreath. So pretty! Anyone that reads my craft hubs knows I'm crazy over buttons! 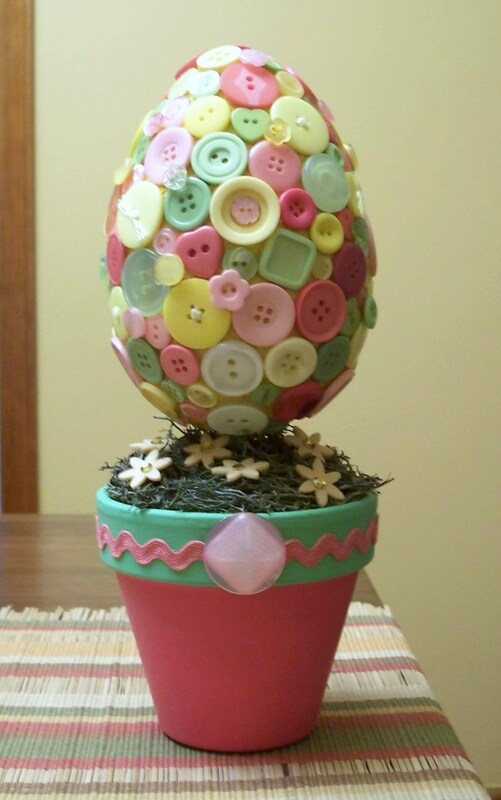 What do you think about this button covered egg topiary? I think it's great. I love the collage of buttons all over the egg.. and the colors couldn't be more perfect for Easter. I love how the terracotta pot has the pink rick rack all around the rim. Learn how to make it at Buttons Galore and More. 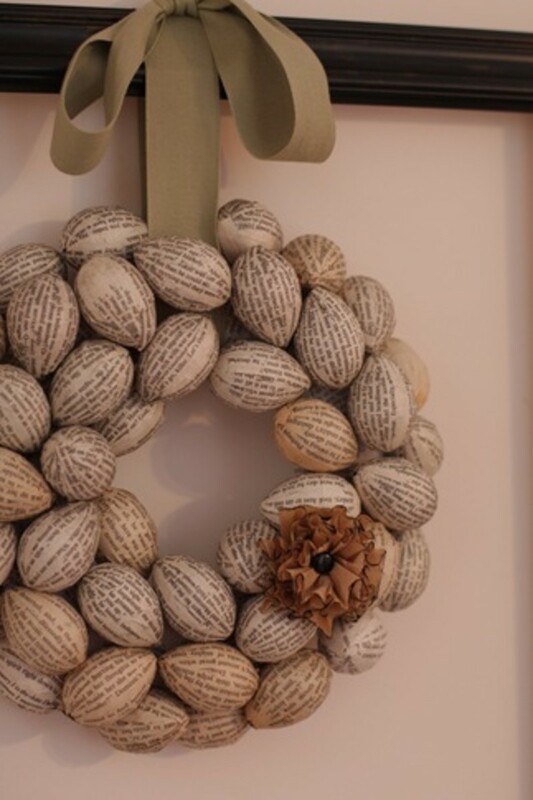 Lemon Tree Creations has the tutorial on how to make this framed book page wreath. The eggs are covered with actual pages from a book that have been mod podged onto the eggs. This is a unique Easter wreath with a more modern look to it.. 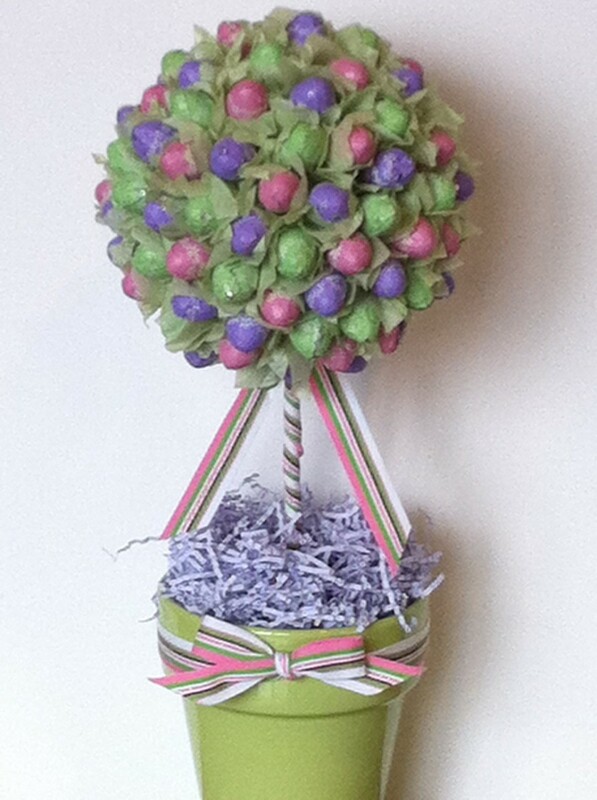 It's not the typical colors yet the eggs and the flower embellishment make it perfect for Easter! 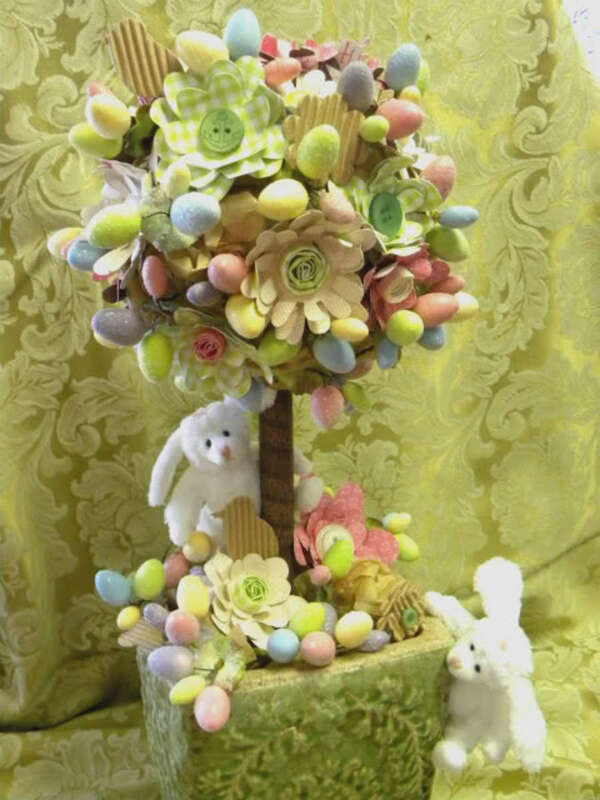 Favecrafts shows how to make these elegant Easter topiaries. These are a little more toned down than some of the others here but still beautiful and perfect for the holiday. These would look beautiful inside the home or outside. I can picture two of them sitting on each side of the door on a front porch. You could even add a few eggs or some colored ribbon just to add a bit of color if you wanted. 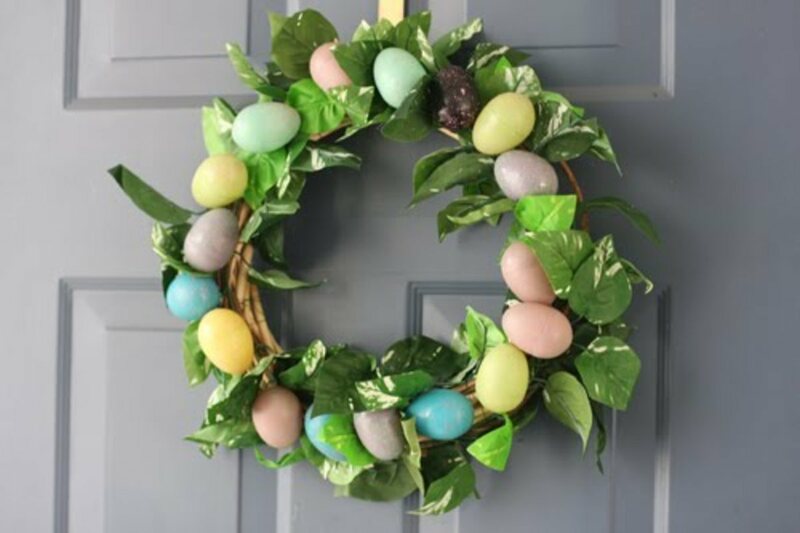 Chic Steals shares how she spent 4 bucks for the materials at the Dollar Tree and made this pretty Easter egg Ivy wreath. Combo meals at a fast food place cost more than that!! Never underestimate the Dollar Tree. It's a fantastic store! 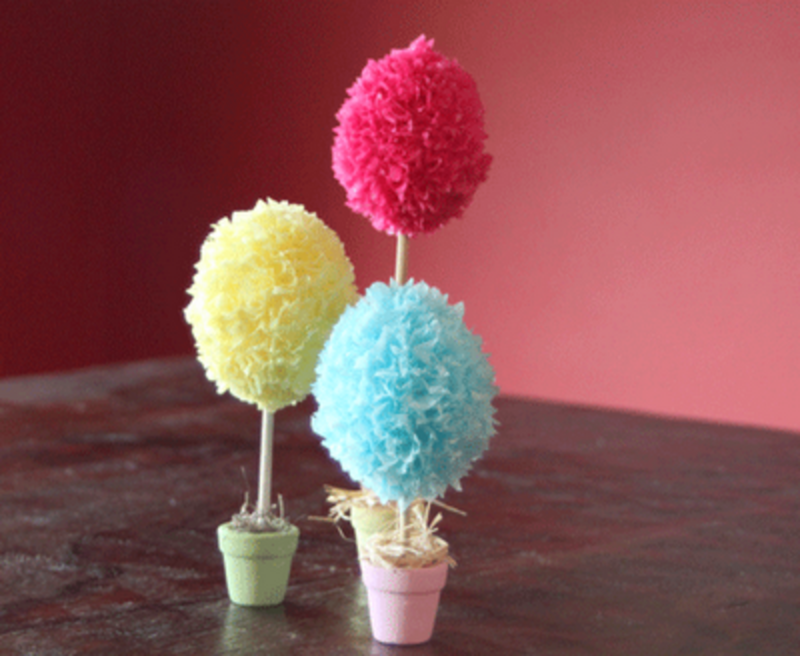 Twiggle Box Blog has the tutorial for these cute fluffy egg topiaries. These are made using tissue paper squares. I remember doing something similar to this in school in art class but somehow none of my projects came out looking as good as these. 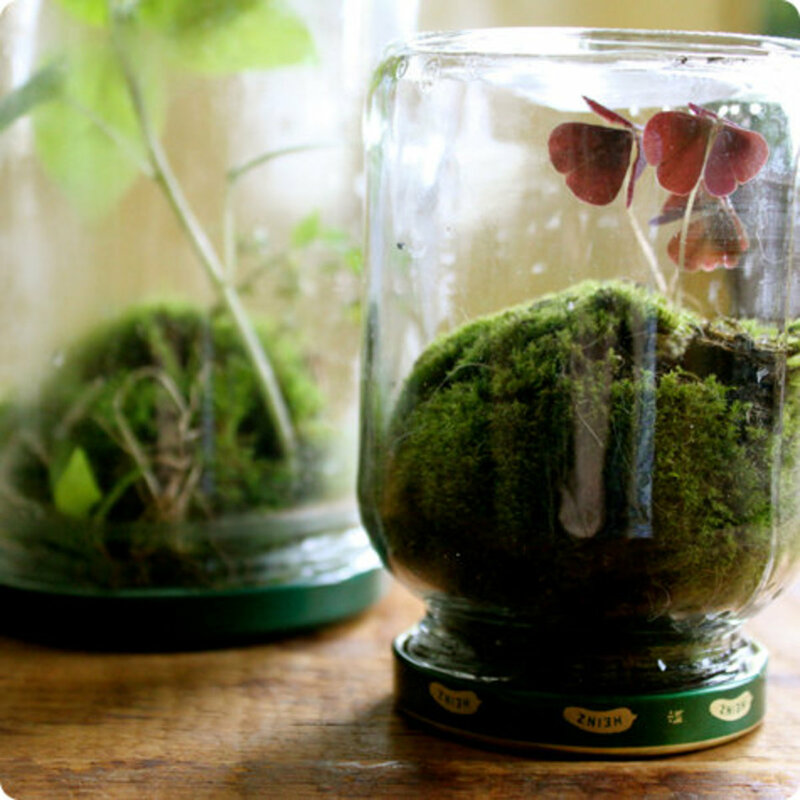 Wouldn't these make cute centerpieces for an Easter lunch or dinner table? Visit the link for the tutorial. Debbie Does Creations shares the tutorial for this pretty tulle and ribbon Easter wreath. I love the bright colors! This one is super easy to make and fairly inexpensive, too. It's made pretty much like those fabric strip wreaths but with ribbon and tulle. The form for it is a wire hanger bent in a circle shape. So cute! 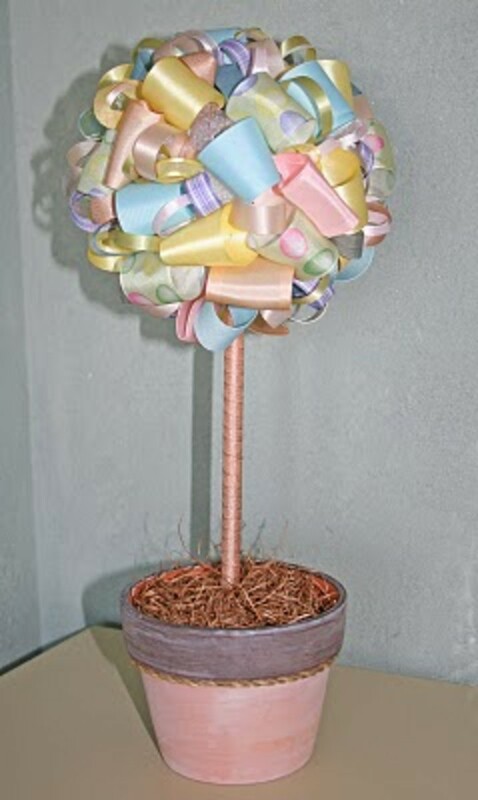 Sew Can Do explains how this beautiful ribbon topiary was made. It has a sort of shabby chic look to it, don't you think? It's made using ribbon loops and she shares the link to her inspiration for this project which also has the tutorial. She made a couple of them alike.. and they are both stunning! Go have a look. 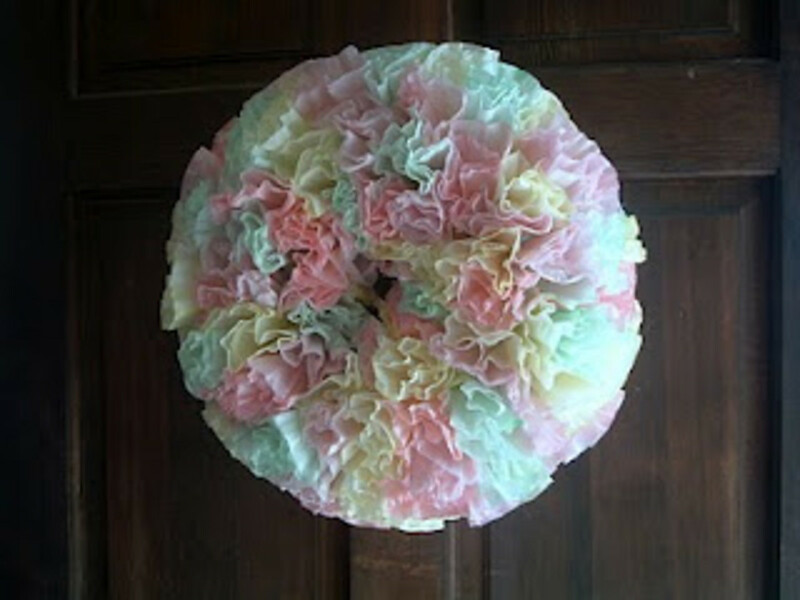 This is what is called a tutu wreath. I had never heard of or seen them before but they look sort of like those cute tutu's that are in style for little girls these days. I love the tulle colors and the fluffy look of it. It's perfect for Easter! See the tutorial at My Creative Way. Jellybeans aren't just for eating! You can make a beautiful topiary with them too. 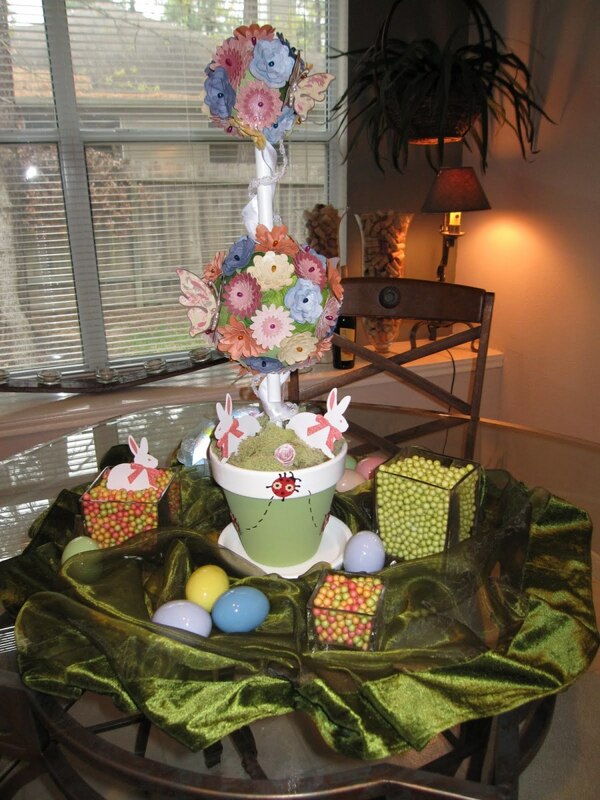 This jellybean topiary is adorable and it's easy to make too. Sometimes candy can be expensive so I suggest maybe buying packages of it at a Dollar Store. They usually have lots of different candies for every holiday and it's much cheaper than even Wal-Mart. Hop on over to My Garden of Eden for the tutorial. 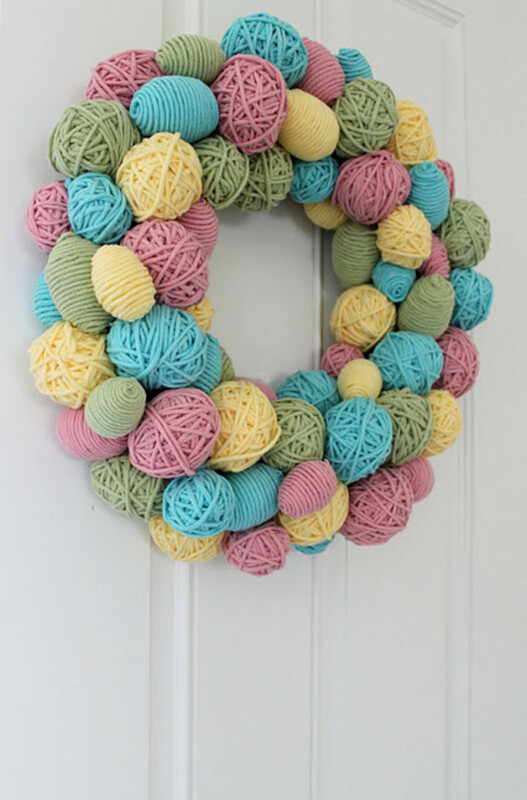 The Sweet Survival has shared the tutorial for this adorable yarn egg wreath. Although it may look like it would be hard to make, you won't believe how easy this one is. To me this looks like solid balls (eggs) of yarn but it's actually just plastic eggs wrapped in yarn. Go to the link to see the full tutorial. You don't want to miss this one! Look at the peep chics.. aren't they cute?! Did you ever think of using them to make a topiary? I sure never thought about it. I think this looks amazing! I love way the colors are layered and also the jellybeans in the pot are a nice touch, too. Go to The Hungry Mouse for the full, nicely photo illustrated tutorial. 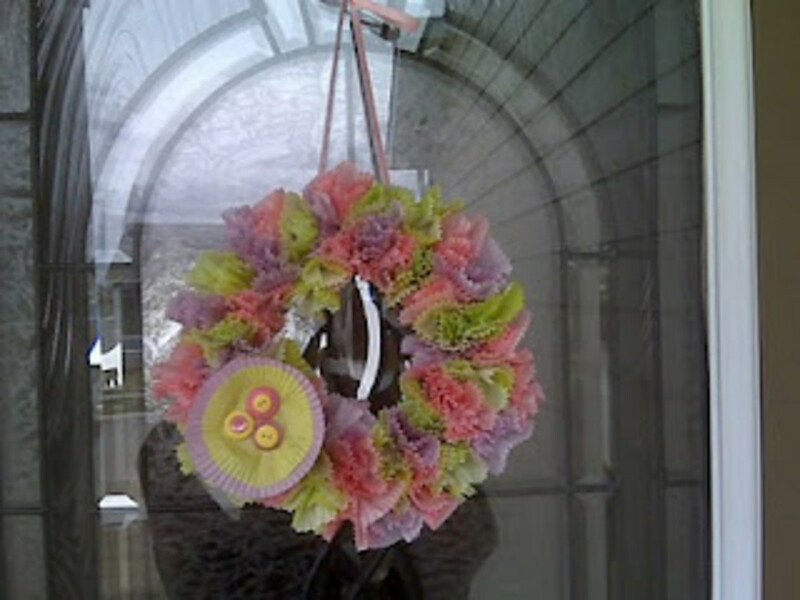 This very cute Easter wreath was made using cupcake liners! These are the kind of crafts I love.. who would have thought it? I love the ruffly look of it.. and the cute flower embellishment on he front. Go to The Strayers for the tutorial. I LOVE this Easter egg topiary...it's fantastic! I like how the eggs have a realistic look to them..I think this is very nice and would be gorgeous sitting out on a porch, in a entryway or anywhere in the house. Of course, you could change up the color of it if you wanted when making your own but I really love the look of this blue one. I found this along with the tutorial at Let It Shine. 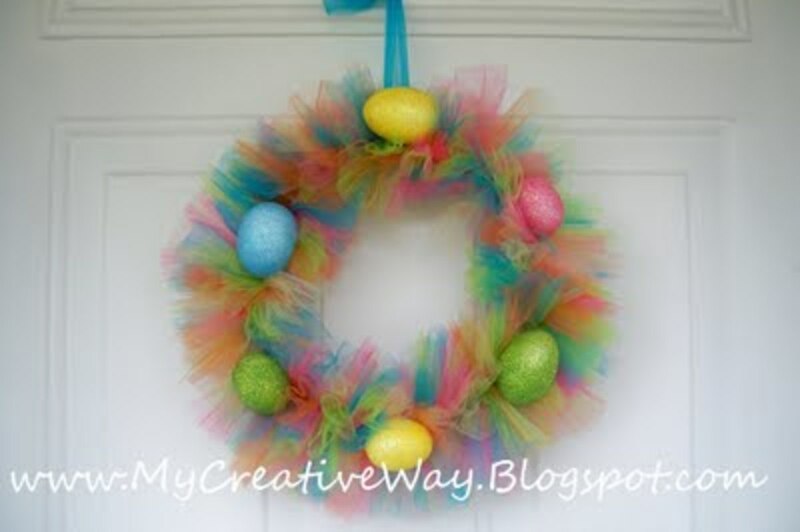 Queenie Eileenie has the tutorial for this ribbon Easter wreath. I love the different prints and bright colors on this one. It looks like it probably does take a lot of ribbon and lots of time to make but these are the type projects that end up the best and you can use it year after year. That is a big motivator for me. Hop on over to see the tutorial. She shares lots of photos in the tutorial too which is always nice. Kim Castillon shares a photo illustrated tutorial on how she made this beautiful topiary. The majority of the embellishments is paper except for the egg garland. I'm really amazed at what people are doing with paper these days. 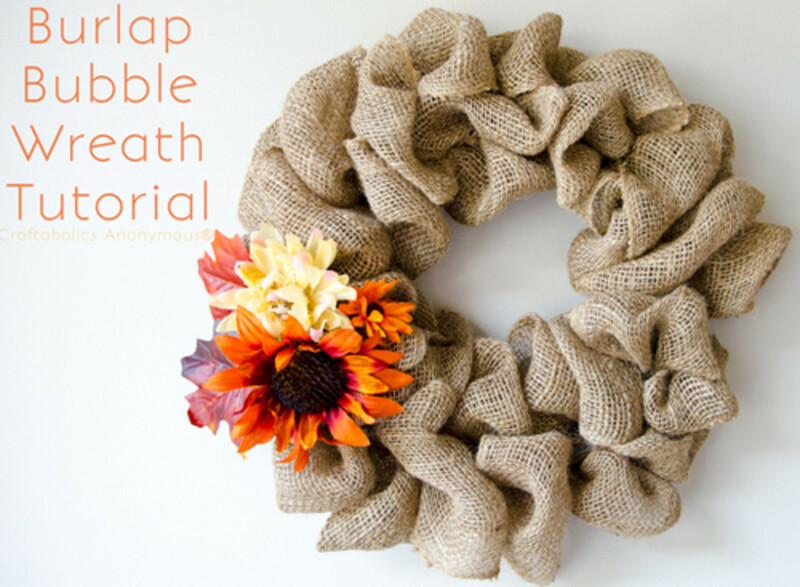 The Country Chic Cottage has shared a very nice, photo illustrated tutorial on how to make this fabulous ruffly wreath. What is really surprising is what this wreath is made of. It's made using two things that many people already have in the kitchen.. coffee filters and food coloring!!! I love projects that are made by repurposing things like the coffee filters and the cupcake wrappers above. 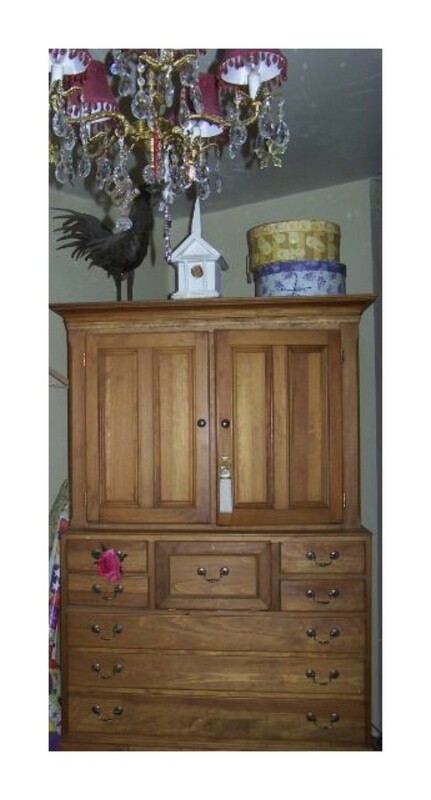 This one has that shabby chic look too. Go to the link above to see how it was made. 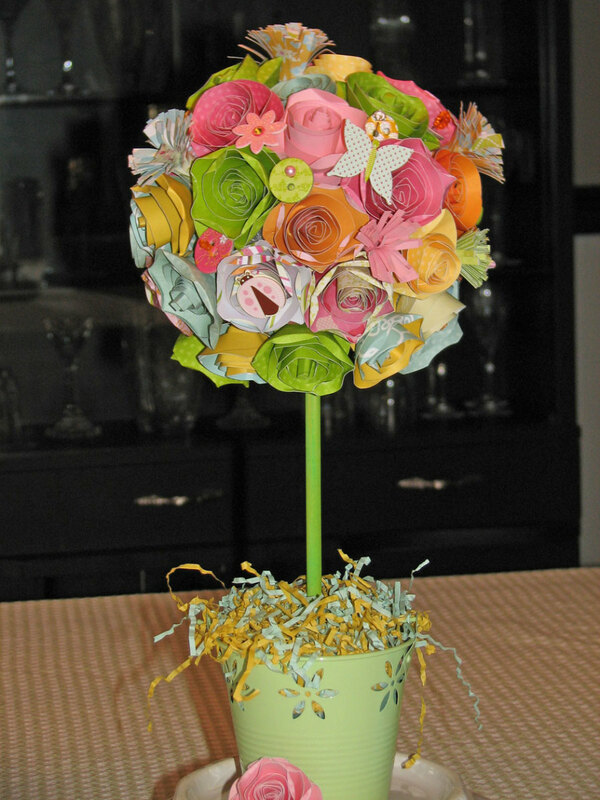 Here's another pretty topiary made with both tissue paper and candy. I think it turned out amazing and love the ribbon embellishments that were added. The mounted candies almost look like flower's about to bloom.. sort of like rose buds. The tissue paper gives the appearance of leaves... or at least to me it does and I love how ribbon was twisted around the dowel stick. Love it! For the tutorial go to Fabulous Fetes. This pretty blue wreath really caught my eye! I love that it has the blue Peeps bunnies glued all around. What could be more perfect than that for Easter?! 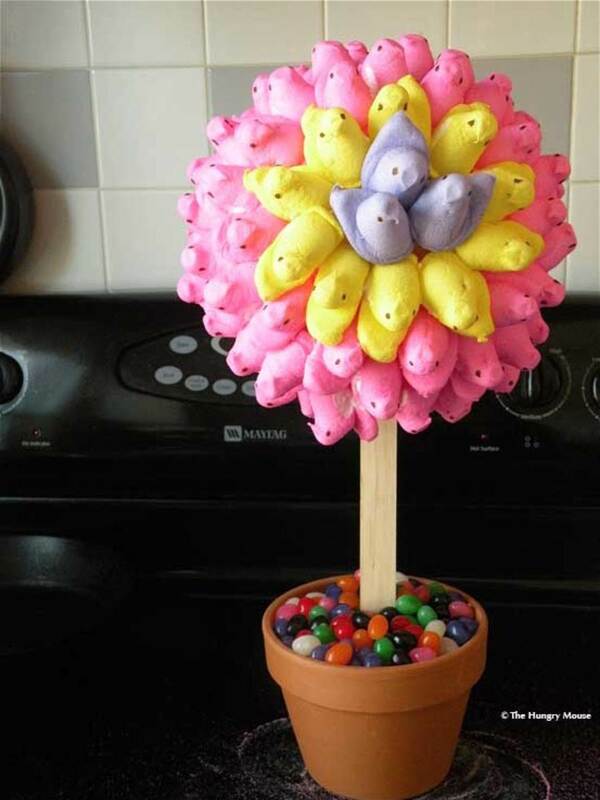 As you know, Peeps come in a few different colors so you have some options if you want to make a Peep wreath. I found this cute wreath at Two Prince Bakery Theater. Go have a look to see how it was made. I couldn't help but share this pretty double topiary I found at Paper Crafting Chic. If you are into Cricut and own a Cricut cutter you will understand a little bit more about the tutorial as the shapes were cut from a Cricut cartridge on a Cricut but if you are not familiar with Cricut you can just use your own flower shapes. It doesn't have to be the exact ones shown in the tutorial. You can still pin them on the topiary but just using your own paper flowers. Click on the link to see how it was made. Isn't this one so pretty.. I love that its made completely from paper embellishments! I hope you have enjoyed this Easter wreath and Topiary tutorial round-up as much as I enjoyed gathering them... Hopefully I've inspired you to create something of your own to decorate your home for Easter this year. Wow! These are great. I especially love the first wreath. I'm crazy for plastic Easter eggs! 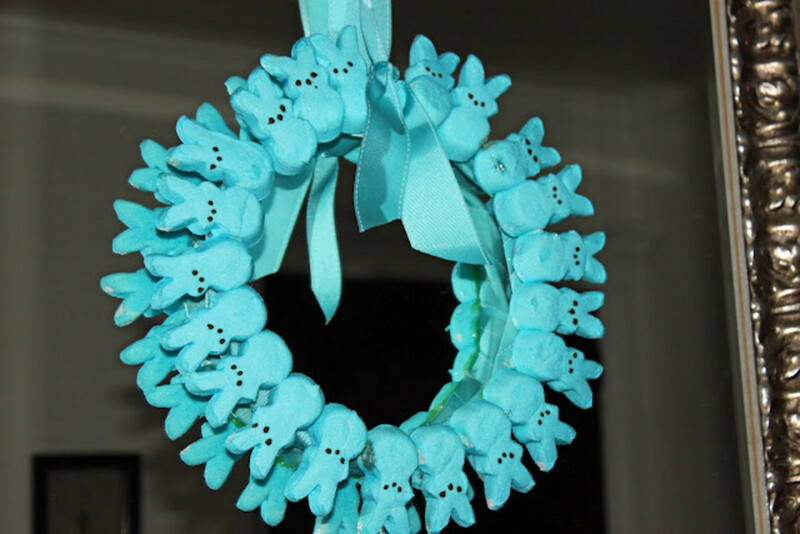 The peeps wreath is a great idea too, especially since I love the way peeps look, but hate the way they taste. 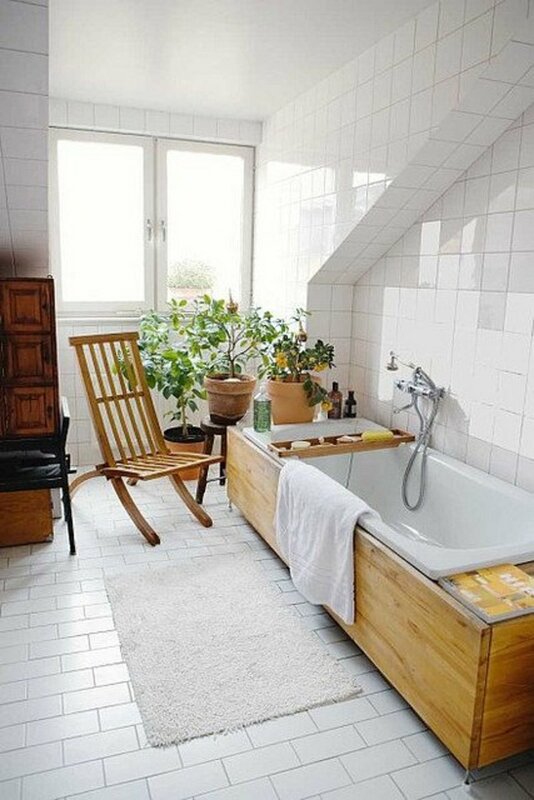 Excellent way of bringing a traditional touch into the house. Thanks for sharing all of these. I'm inspired now to do a tutorial for the Easter project I did this year. Thank you for highlighting my Spring Topiary!! I'd be happy to have you highlight more of my crafts! Hi craftdrawer, I am glad that you like these. Thank you so much for stopping by!! These are so pretty! Love the colors of spring great ideas thanks for sharing! ameypp7- Thank you! I am so happy that you like these tutorials :0) Stay tuned, lots more craft hubs to come! Hi! !Thanks for sharing your ideas. I am truly inspired and i would love to know more....!!! Thanks for including my topiary tutorial in your post! Love a lot of the other ideas... puts me in the crafting mood. I really enjoyed your site too! I just hopped over to see it and it's gorgeous! Thank you for sending me the link! 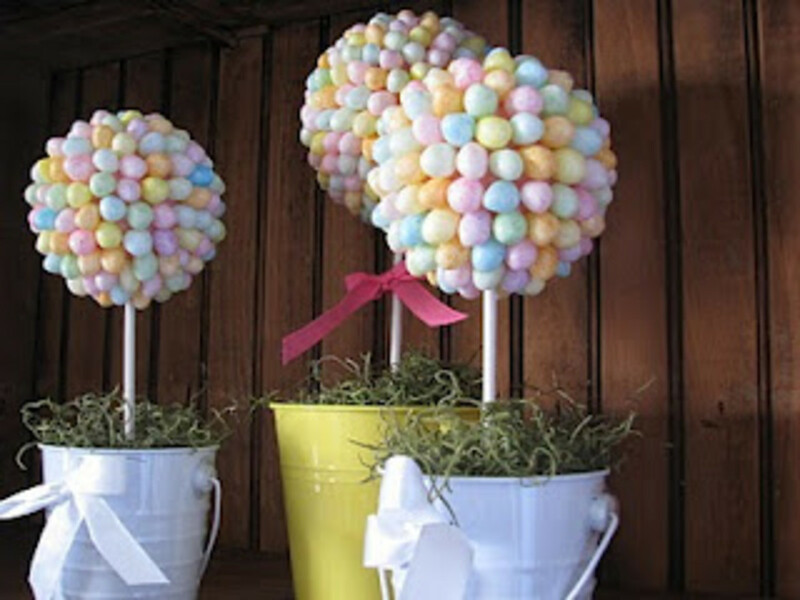 Hi Jamie, I love to see Easter decorations and these are fabulous, my favourite is the button egg topiary. A great hub thank you and voted up. moonlake, thank you for stopping by and thank you for the vote! Thanks so much for including my topiary! Their all so pretty. Enjoyed looking at your hub. Voted Up. Tina, Thank you so much for the vote! I love the button one too...It might just be my favorite out of them all. I am so happy to know that this hub inspired you! I have another hub with just button crafts.. If you get a chance sometime, you should have a look..I bet you would like some of those too. Thanks for dropping by! 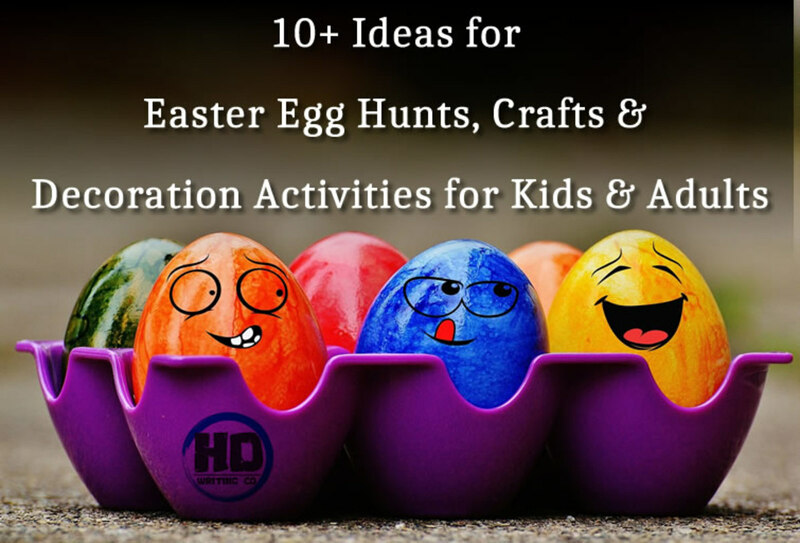 This hub is great inspiration for Easter decorating! My special favorite is the button covered egg! So unusual and now I know what to do with all the buttons I have saved during the years. I like buttons and in this way I could have some of them on the table instead of in a jar in a cupboard! The other ideas are beautiful too! sllvncookie- Thanks for stopping by! I agree with you.. they are all beautiful but I can't take the credit for making them... these were made by lots of different people. I'm sure planning on trying to make a few of them for myself though!